If you haven’t already seen them yet, I recommend reviewing our lessons about the modal verb MUST and also the lesson about difference between MUST and HAVE TO. 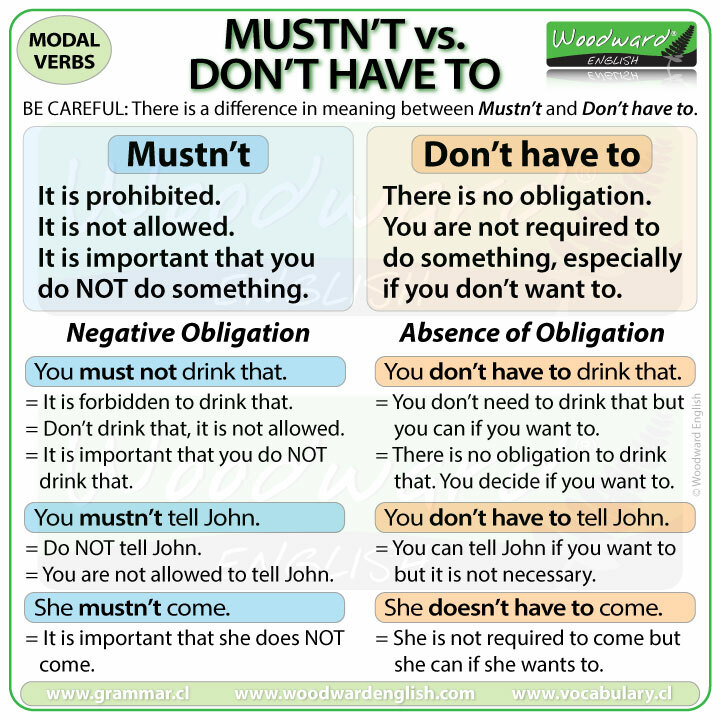 In this lesson we are going to look at the difference between MUSTN’T and DON’T HAVE TO. What is the difference between MUSTN’T and DON’T HAVE TO? Be careful with the negative of Must and Have to. There is a BIG difference in meaning between Mustn’t and Don’t have to. Mustn’t means something is prohibited or it is not allowed. Don’t have to means there is NO obligation to do something. You are not required to do something, especially if you don’t want to. You can do the thing if you want to. Let’s compare the two together where it will make a lot more sense. You must not drink that. = This means it is forbidden to drink that. = Don’t drink that because it is not allowed. = It is important that you do NOT drink it. You don’t have to drink that. = You don’t need to drink that but you can if you want. = There is no obligation to drink that, you decide if you want to. You can see that Mustn’t is a negative obligation while Don’t have to is an absence of obligation. Don’t have to means it is not necessary, it is not compulsory, but you have a choice. You have the choice to drink that or not. However Mustn’t is an obligation NOT to do something, in this case NOT to drink that. You mustn’t tell John, and You don’t have to tell John. Can you see the difference? = Do not tell John. = You are not allowed to tell John. You don’t have to tell John. = you can tell John if you want to but it is not necessary. You decide if you want to. We can also use these in third person. Mustn’t is the same for everyone but don’t have to becomes doesn’t have to in third person. = It is important that she does NOT come. Maybe because we are organizing a surprise for her and we don’t want her to know about it. She doesn’t have to come. = Here we let her now about the meeting or whatever. She is not required to come but she can if she wants to. Notice how we used doesn’t have to instead of don’t have to. Let’s practice. Complete the sentences with MUSTN’T or DON’T HAVE TO. You ________ come if you don’t want to. I ________ be at the meeting but I think I’ll go anyway. Passengers ________ speak to the driver. You ________ eat it if you don’t like it. In boxing, you ________ hit your opponent below the belt. They ________ talk to each other during the exam. You ________ pay for your tickets now but you can if you want. You ________ play with those wires. They’re dangerous.